We kick off this episode with Gentlemen high school dignity. The characters appears to be taken from a manga. First we have Kwang Soo who declared that he is the captain of the Track and Field club, followed by Haha and Gary who fought for the position. The door opened, and teacher Ji Suk Jin came in. Song Ji Hyo yelled at the boys and stated that she is the captain. The other boys said that this is an all boys school. Ji Hyo replied that she is a boy wearing a skirt. 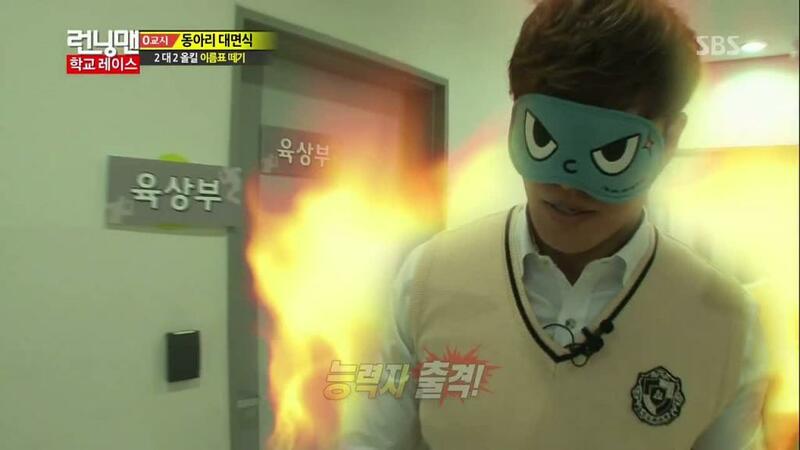 The commotion has anger captain Kim Jong Kook as he slammed open the door and threw his jacket on the floor. Everybody stood still and rise up their hands. Haha pointed that Kwang Soo wants to be the captain. Kwang Soo immediately picked up Captain Kim Jacket and said he is the hanger. At the other side, we have the drama club and it was announced that Yoo Jae Suk has transferred from the altheletic team to the captain of drama club. Yoo Jae suk kept grumbling that it was a sensitive issue to transfer club. Next, we saw all the members falling in. Family Outing Game Devil Kim Soroo, pretty boys Kim Woobin, Lee Jonghyun (CN blue), Lee Jongsuk and Min Hyorin assembled. It was announced that today theme is 'Gentleman high school dignity competition' whichever team win in a race will receive a flag and they have to protect the flags till the last game. The first game is a tournament whereby two members from each team will be blindfolded as they reach their respective place and engage in a nametag tearing game. 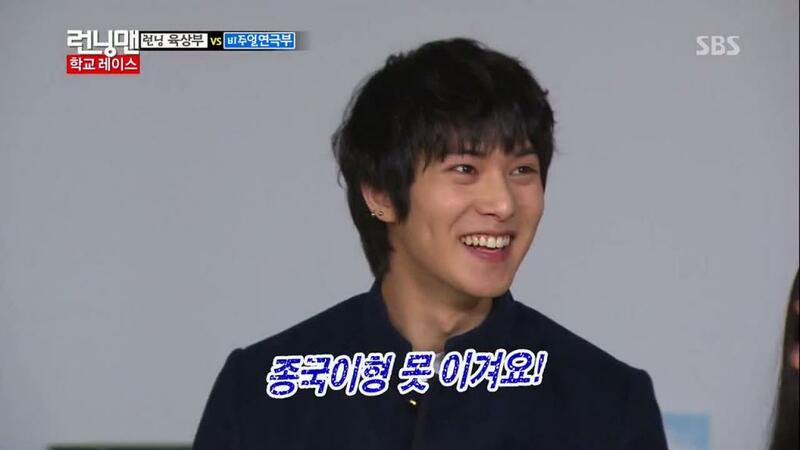 Jong Hyun immediately lamented that they will lose this game because of Jong Kook Hyung. Game devil Kim Soroo was'nt pleased to hear that and stated that they should live positively. Yoo Jae Suk recalled that Jong Hyun had guested in Running Man for three times and he was always eliminated by Jong Kook. Despite that, the drama club decided to sent Woobin and Jong Hyun to the field. At the other side, the altheletic team were discussing their strategies. Next we saw the betrayal brothers Ji Suk Jin and Lee Kwang Soo being blindfolded and led to their respective position. The betrayal brothers cried out to each other as they were separated. It does not take long before Woobin and Jong Hyun spotted Girrafe Kwang Soo and gave chase. They surrounded the betrayal brothers in a few minutes. Ji Suk Jin was tired with all the struggle and intended to leave Kwang Soo alone to deal with the youngsters. Kwang Soo called out to Suk Jin and he came forward to help, in return betrayer Kwang Soo leave Big nose hyung to them. Not surprising, Ji Suk Jin was the first to be eliminated. With the impala Ji Suk Jin eliminated so early in the game, commander Kim Jong Kook was flaming mad as he stood up and make his entrance. On the other hand, the drama team rejoice at the announcement. They spectaculated that Kim Jong Kook should be kept till the last. Never did they expect that Jong Kook make his entrance early in the game. Kwang Soo who had being waiting for his team member stood near the lift and when he saw Kim Jong Kook being blindfolded, he took revenge by leading captain Kim to bump on the walls and chairs. As expected, the next moment Kwang Soo was being punished by Spatakook. In an attemp to lure the duo to the place where the commander laid ambushed, Kwang Soo shouted out loud. However, when the drama team spotted Commander Kim, they immediately retreated and ran away as fast as they could. Now the situation has reversed and the drama team have to hide from the Athletic team. Soon, Kwang Soo and Jong Kook found their hiding place and they joined hands to eliminate Woobin and Jong Hyun. That was a big blow to the Drama team as they lost two members and they immediately guessed that Kim Jong Kook is out at the battle field. Next, the Drama club send Lee Jongsuk and Min Hyorin to the battle field. It was like an idol drama when they saw Jong Kook and Kwang Soo and they held their hands to escape together. Feeling envy, Kwang Soo suggested to Jong Kook that they should hold hands too. Jong Kook immediately dismissed the idea. Soon, Kwang Soo and Haha were eliminated by JongSuk and Hyorin while Jong Kook was at the other side. The Drama team wonder what is wrong with Jong Kook and next Song Ji Hyo joined hands with Jong Kook.Finally, the Spartace team is back in action and it was no surprise that they eliminated the other team easily. Finally, the drama team trump cards were called to the battlefield. Yoo Jae Suk spotted Jong Kook and Ji Hyo from a distance and attempted to lure them to Kim Soroo. The Spatace couple saw through his trick and wondered who is the other opponent. Eventually, they met and went head to head with each other. Kim Soroo and Yoo Jae Suk torn Jong Kook name tag. Gary was called to the field after Jong Kook elimination. The Monday couple met and felt threatened by the other team. The next mission was set at the canteen. Each teams were seated at different tables as they munched on their snacks. The PD asked each team to write down something that they were good at to play the game. When the food relay challenge was announced, the Athletic Club rejoices as this is what they does best. They were supposed to eat and drink all the items lay out on the table. These includes ahard boil egg, a cup noodles, ice cream, chocolate, , a bottle of water and a bottle of Coke. The Athletic team did pretty well as they gobbled down all the foods until it was Jong Kook turn to drinkthe bottle of water and Kwang Soo interrupted him by tapping on his throat. After he regained his calm, he finishes the bottle of water. Finally, it was Kwang Soo turn to drink the bottle of coke. He drank amazingly fast but when he is about to whistle, he gave a loud burp to the laughter of everyone.The Drama Team tried their best to gobble the foods except that the pretty boys does a better job as they eat gracefully. Eventually, the Drama won the game as they completed the mission at a shorter time (10 seconds) lesser than the Athletic team. The next game is to do a spilt and join their foots as a team and see who can reach the furthest on the line. The Athletic team complained that it is unfair as the other group has taller people. Nonetheless, the Drama team were lacking in exercise as they have problem even in spreading their legs. During the process, Jong Hyun even torn his pants and he need to use his jacket to protect his modesty. The Athletic team tried to spilt their legs under the command of Captain Kim. Eventually, Gary managed to reach further than the Drama team and they won this round. Now the Drama team punishment is to pay for the meals. Kim Soroo took it upon himself and paid for all the expenses. The third mission was at the pool and we saw the floating board in the middle. That was a similarsight as we were shown flashback of the game during X-Man. Kim Jong Kook and Kang Ho dong wrestled on the floating board. Yoo Jae suk was the vanguard for the Drama team and he tried to threaten the other team. However, his opponent was Jim Jong Kook and he flauted his six packs in front of the other team. Lol. In return, Jong Kook tried to scared the other team by charging forward. Yoo Jae Suk Kept on retreating and the frightened look on his face was so funny. The Atheletic club hide behind Jong Kook and laughed at Yoo Jae Suk. To retaliate, Yoo Jae Suk exclaimed that they will be rolling pins without Kim Jong Kook and he turned around and lamented that there were taller guys than him in his team, why is he the vanguard at the front. Kim Jong kook made use of this opportunity to to attack the Drama team. The first round, the Athletic team won. The second round, Peaceful Gary rules as he flipped Jong Hyun and Jongsuk into the pool before he was pushed into the pool by Woobin. Yoo Jae Suk stepped up on the game and charged forward, however he need to overcome the obstacle- Kim Jong Kook. Surprisingly after Kim Soroo fall into the water, Kim Woo Bin fall into the pool too after he attempted to attack Jong Kook but was instead pushed into the pool. Jae Suk being the underdog, tried to trip Jong Kook over and succeeded and he secured a win for his team. Finally, thegame devil Kim Sooro charges towards the Altheletic team and overthrown them like bowling pins. The last game is to place their flag in the right flagpole within 30 minutes. Everyone was taken to different levels of the school building. Jong Kook and Haha deduced that Kim Sooro must be protecting his team flag. Therefore, when they saw him at a corner, they chased after him. Soon they were joined in by Ji Hyo. Unfortunately, the team flag was not with him and he mangaed to tricked them. Ji Suk Jin found Woo Bin with the team flag and he informed the Monday couple who laid in ambush outside the room where he hides. However, Woobin figure out a smart way to escape and that is to jump out from the side window. He went back to his original hiding place but was found by Kwang Soo. He tried to espcape but Jong Kook was on his tail and managed to pin him down. Haha got the flag and ran to a storage room. Soon, he was greeted by Sooro with a devilish smile. He snatched the flag away. 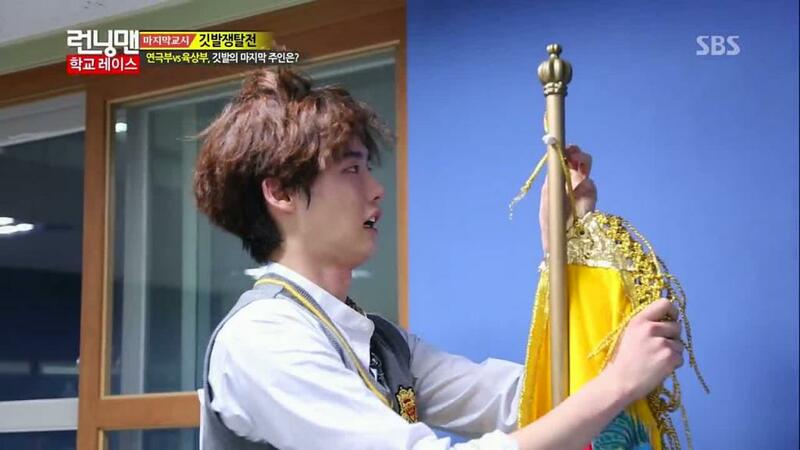 After another struggle, Jong-Seok got the flag and rushed off to the flag pole but he was intercepted by Jong Kook. With 3 minutes left, Haha ran to the gymnastic room to tied the flag on the flag pole. However, they tied the flag to the opposite team flag pole. Eventually, Jong-Seok managed to hang his team flag on the flag pole and secured a win for his team. This is a hilarious episode where we can see the amazing teamwork of the Running Man. The first part of the show was funny as we see the Running Man fighting to be the captain and suddenly Kim Jong Kook opened the door and act angry. He almost laugh out lot when he threw his jacket on the floor. On the drama team, i am glad to see some eye candies. However, the team will be considered weak if not for Kim Sooro and Yoo Jae Suk. Yes, based on age the guests has an advantage, however, the Running Man members has much more experiences. The strategies for the first game was good. The drama team did not expect Jong Kook to come out early in the game. Therefore, most of them were in for a surprise when they saw the commander. Kwang Soo as usual betrayed the impala Ji Suk Jin, i felt pitiful for the race starter. The Second game at the canteen was interesting. Especially the part where Yoo Jae Suk and Lee Kwang Soo burp after they drank the coke. The only part which i dilike is when Lee Kwang Soo tap on Jong Kook throat while he was drinking water. This prank was not funny and it could be dangerous too. Nonetheless, it is a variety show and it is supposed to be for fun so got to let it pass. The third game at the pool was fun and i always like to watch Running Man water sport games. Kim Jong Kook was so cute when he showed off his muscle and trying to scared Yoo Jae Suk. It was interesting that the guest were all pretty weak in their physical strength. I like Kang Gary act cool face when he won against the idols. Kim Sooro last attempt to charge on the Atheletic team was bravo and it works as they were hit like bowling pins. The last game was a little boring but they did make the game interesting with all the passing and running. I rooted for the Running Man team to win but i am fine that the Drama team wins.